A slick hybrid, but full of compromises. Lenovo has been at the forefront of the hybrid market with its Yoga machines, which have appeared in numerous guises: some have been expensive ThinkPad-branded business devices, others have been affordable consumer systems, and yet more have been stylish high-end products. Lenovo's latest, the IdeaPad Yoga 2 11, has its eyes set on consumers who want to straddle the line between laptop and tablet without spending more than £500. Every Yoga device shares one thing, and that's Lenovo's folding hinge. It rotates through 360 degrees, and means these machines can be used in traditional notebook or tablet configurations, as well as in Lenovo's standing or tented positions. The firm says the former is great for propping the screen up to watch movies or give presentations, while the latter is ideal for using this touchscreen device in the kitchen. The hinged mechanism adds versatility and works well. It's sturdy enough to survive constant action without breaking, but it's easy enough to twist and turn without difficulty. It's just as simple to use as the Lenovo's rivals, many of which have different designs: the Asus Transformer Book TX300 and Toshiba Satellite W30t have screens that detach completely from their keyboard sections, and the Sony VAIO Duo 13 and Acer Aspire P3 have screens that prop up on their base sections, which means an easy switch between tablet and laptop mode but smaller keyboards. Lenovo's effective hinge is joined by good design elsewhere. The Yoga's aesthetic is simple, but it works: a metal-effect plastic wrist-rest is held in place by a soft-touch black plastic base that gently curves upwards. The lid is a subtle dark colour with a shining Lenovo logo, and the only thing we don't like is the glossy bezel – it's too wide. Build quality is mixed. The wrist-rest barely moves, and the underside is similarly strong, but the keyboard's base is far too flimsy, and the back of the slim screen has too much give – it twists from side to side, and pressing the back of the panel caused the desktop to flicker. Lenovo's latest machine tips the scales at 1.35kg, and it's 17.2mm thick. That compares well to rivals – only the Acer Aspire P3 is lighter – and it falls in line with some of the smaller Ultrabooks we've seen. That bodes well for laptop usage, but it's hardly ideal for the Lenovo's tablet mode. It's still twice as thick and heavy as proper tablets and, thanks to that 11.6in screen, it's a lot wider too. It's fine for propping on a lap or on a desk, but it's difficult to use the Yoga in one hand for any length of time. 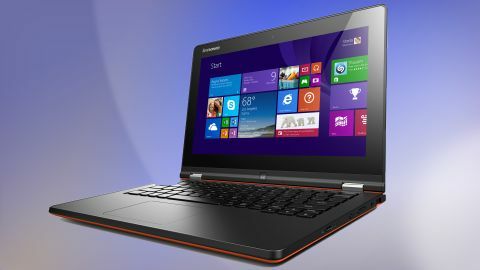 Lenovo's devotion to hybrids means the Yoga is compromised when used as a laptop, too. Our main bone of contention is the keyboard: the flimsy base doesn't impact much on usage, but the keys themselves are poor. They've barely got a millimetre of travel, and each button feels hollow and unsatisfying. It's fine for tapping out emails, but no good for serious work. There's also a single-height Return key and no number-pad. The keyboard makes itself known during tablet mode, too. Flipping the screen over deactivates the keyboard, but it can still be felt when holding the Yoga in two hands, and everyone who tried this machine found it irritating. We also had issues when flipping the Yoga back to laptop mode – occasionally the keyboard or trackpad failed to reactivate. There's nothing special about this machine's port selection: you get single USB 2 and 3 sockets, an SD card reader, a micro-HDMI output and a headphone jack. There's little to shout about with network connectivity either – there's no gigabit Ethernet, and the 802.11n Wi-Fi is only single-band.